Controversy has hit our happy beer tasting series from the Ardennes winter retreat -- or at least it seems I screwed up the other day, when I said the small town of Malmedy had two breweries. In fact, it only has one, as has now been pointed out to me in a letter from that unique establishment, Brasserie de Bellevaux. I reviewed their Black beer and found it “yummy”, which is a statement that needs no correction. I also have notes here to write about their Brune, so stay tuned for that blog entry. 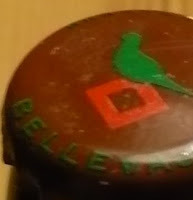 Where I got confused was when I reviewed Bière de Malmedy Brune, which I’d thought was also made in the Malmedy commune, but is actually brewed by Brasserie Lefebvre in Quenast, a town a bit south of Brussels, makers of Floreffe among others. The lorry was not the means for exporting Bière de Malmedy to the world but rather, I now suppose, the means for importing Bière de Malmedy INTO Malmedy. Where is my Belgian beer from?